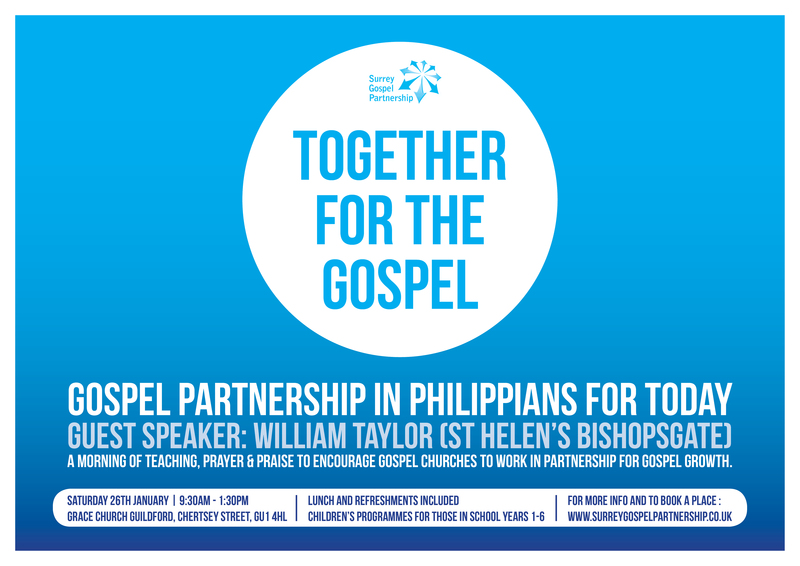 We're really looking forward to the next Surrey Gospel Partnership (SGP) event on Saturday the 26th January - a morning with Wiliiam Taylor, (St Helen's, Bishopsgate) looking at how we can better partner together for the gospel. This is for all the church family. The SGP exists to bring the gospel to all in Surrey and North East Hampshire through local gospel churches committed to healthy gospel growth in active gospel partnership. There is much talk about 'partnership' when it comes to gospel ministry and to the work of the Christian gospel, but what does that word 'partnership' actually mean and what does the Bible say we should be involved in if we are in 'partnership' together? 'Partnership' is the great theme of Paul's letter to the Philippians. Over the course of the morning we shall be looking at what God has to say about true 'partnership' in his glorious gospel with speaker William Taylor from St. Helen's, Bishopsgate. SGP are pleased to offer children's work for children in school years 1-6 alongside the main meeting. Spaces are limited so please book tickets early to avoid disappointment. This work will conclude at 12.30 when children, parents and all other delegates are warmly invited to stay for a sandwich lunch and take the opportunity to get to know each other better. There will be a bookstall available on the day. Attendees are welcome to make a donation towards the cost of the day. There will be an opportunity to do so on the day.